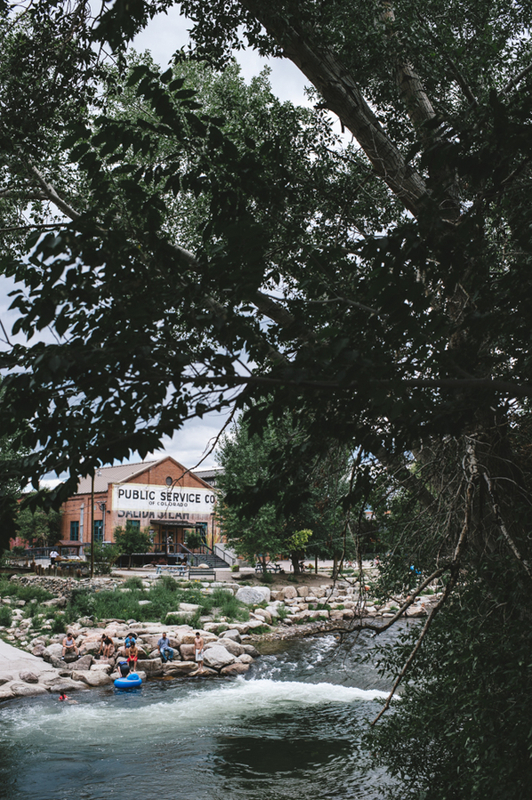 The SteamPlant Event Center is a stylish, urban venue in downtown Salida, Colorado, linked by a plaza to the banks of the Arkansas River, and surrounded by stunning views of the Rocky Mountains. The SteamPlant is uniquely designed for weddings, receptions, corporate meetings, art exhibits, and entertainment. At the heart of Salida’s Creative District, the SteamPlant is a stone’s throw from the many restaurants, shops, and art galleries in Salida’s quaint downtown, a designated historic district. The renovated 1887 steam power plant offers a spacious ballroom with century-old brick walls for dining and receptions. It seats up to 180 guests, has full banquet facilities, and overlooks a picturesque outdoor plaza and the Arkansas River. Our grounds also include a 200-seat theater, several art galleries, and a convention space with fully equipped conference rooms with high-speed WiFi and complete presentation capabilities. To begin planning your SteamPlant wedding, please call (719) 530-0933 or email info@salidasteamplant.com. You can also visit us at: www.salidasteamplant.com. We are always excited to show off our favorite SteamPlant weddings. Take some time to tour these photo collections and begin dreaming about your perfect day!